shaded in the picture are the resistors that i replaced, i took out the the burned ones with the color code (red,black,black,gold)20ohm and put those(red,red,black,gold)22ohm resistors. if they are not correct please let me know so that i order the right ones. Thise are nit at the same location as my picture. 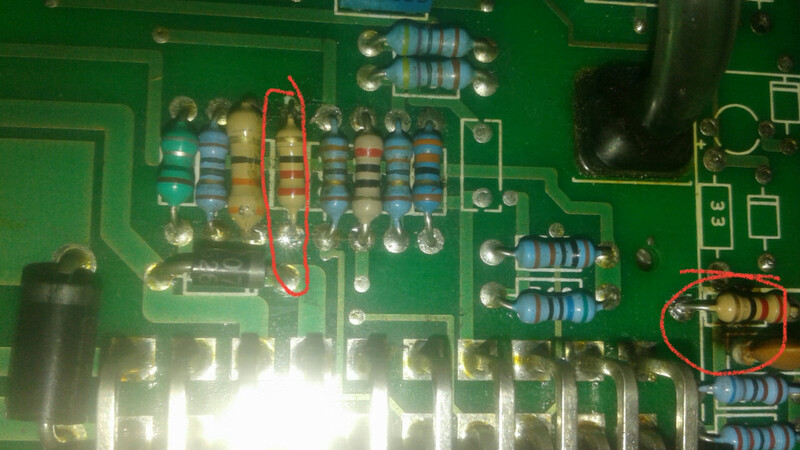 Please trace them to the pins to see what circuit those are for. My guess is that it is for the input pulse from trigger wheel. You said before it did give you rpm when you held the sensor close to the teeth on one of the cambelt pulleys. I still believe that you have an issue that the gap is too large between the sensor tip and the trigger teeth. yesterday i took my box to be checked and the tech told me that the box its good and the resistors are the correct ones its just wiring that messed up. today i gave it a try, checked the wiring especially the crank sensor one. 3. i tried swinging the engine but my starter wasn't turning the engine fast enough. i think the solenoid gave in. but during that process the yellow\ember light was flicking so i think. so i have to deal with the starter issue and will update you. Are you sure you have the red and white wires connected to pin 1(red) and pin 2 (white) at the sensor end and not between 2 and 3? What was RPM reading indicated when you got a reading? ill have to run the test in the morning and ill update you. 2. i cud hear the `brrrrr` sound but it doesn't have enough power to run itself. 4.when i try to connect on the laptop to check the setup it doesn't wanna connect. are you saying that picture is with the engine cranking or just switching it on? RPM reading of 173, zero timing or fueling values, -9 degrees water temperature ( geewizz that is cold temperature). Did you load a start up map into ecu??? Please take pictures of your main page, fuel and ignition pages and post it here. those reading are for when i put the car on. it primes three times at a go with different readings. hope ill get it right soon. 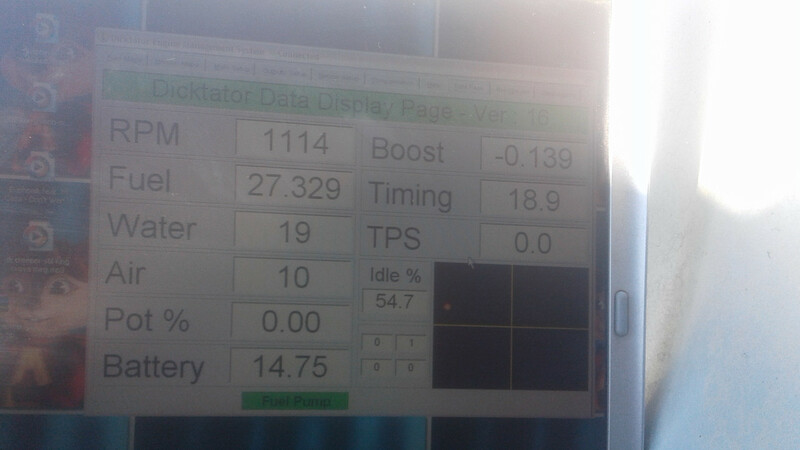 these are the data readings i got just now after checking the timing. i am concerned about the timing reading of 10.5 mustn't it be 20.00? Jo is on his way to Brasil - sure he will comment when he has signal again. Please post the timing page and fuel page too? Are you sure all wiring is correct? From the picture I see over temp readings on water on a picture, fuel values VERY high and not close to where it is suppose to be. 14,75 volt in one picture. Just to clarify for all by the primes you did was only ignition switched on and not started motor or running motor. If it is just switching on ignition and checking values, there is definitely something wrong with your wiring. Tell me where is the thick black wire connected and also the thin black wires for sensor earths and what sensors are you using. Yep those are when i put the car on. The water temp switch i think it has problems when i touch the wiring it works fine but ill change it today. Please note that when i plug the shielded ground on the crank sensor it dsnt read the engine pulse when a swing the car. Must i jus order a new wiring loom? 2. Water temp switch Are you using a single blade or two pin sensor here? If two pin, you connect one thin black wire and purple wire to it, if single blade type sensor, connect only purple wire and close up the thin black wire. Please note that when i plug the shielded ground on the crank sensor it dsnt read the engine pulse when a swing the car. Double check the pinout on the sensor, measure the pins with a multimeter and between pin 1 and 2 you should get a resistance value. With ignition switched on you should get no RPM reading. RPM reading only when you crank the motor. Due to the false RPM reading, the timing will display the value corresponding on the ignition map in the block related to timing RPM value on the map. so papajo whats the best way to go from here? You have a serious wiring issue if you get rpm readings when you switch the car on. Recheck all your wiring as per Dicktator wiring diagram. Remove all wiring and start over using the wiring diagram and ensure all connections are properly insulated. as promised i`ve been on the car since morning, and ive checked all wiring one by one soldered every wire joint and ive insulated every soldered wire. the only problem i am facing is the water temp switch is reading over when i put the car on, so ill be changing it during the week. you cud hear it going like its gonna catch but nothing good happened. so im thinking of ordering the replacement 60-2 wiring and the water temp switch. i saw the replacement wiring @ performance products SA if you guys know people you trust please tag them ill give them a ring tomorrow morning. The red wire you refer to, is it the one on pin 8 on the wiring and is the thinner red wire of the two in the harnass? That is the switched power from ignition and size wire is adequate size. The red power wire going to pin 30 on relay is connected to the battery positive terminal and is addequate for the job. Priming once is correct and the RPM reading is good enough during motor cranking. What temperature sensor are you using and how is it wired to the ecu? The “over” temp reading you are getting is suggesting to me that you are having a short circuit on the temperature input. For a test, you can disconnect the temperature wire to the sensor and swing motor again. This can also give you the high fuel value of 6-8ms. Once you gave the temperature reading, you need to calibrate the temoerature values. By saying it almost catches, I presume you have confirmed spark and fuel. What is your fuel pressure on fuel rail, plugs dry or wet and black? Any fuel smell? What is the main setup page values and trigger input sekections set to? Post pictures of those to check. What is the trigger angle value on the main page? Wrong trigger angle could also prevent motor from starting. too much. Should be around 1.6 to 2.2 odd for normal sized injectors on idle.